> Research Library > Dell Software > More Data Backup is Going Virtual; Is Your Business Ready? If yours is like 52% of IT organizations, your IT stack isn’t 100% virtualized. This probably means you’re managing two backup solutions: one for virtual and another for physical. Virtual capabilities that were once cutting edge are becoming default, but how do you balance ease-of-use with staying ahead of the curve? 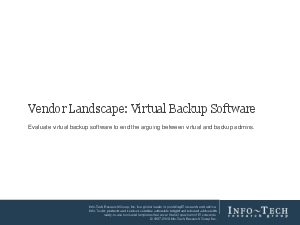 We drew upon the best research to help you find the optimal solution for your organization: Vendor Landscape: Virtual Backup Software.